The Kershaw Sea Hunter 1008BL-P knife has a blade that is made of corrosion resistant A20J2 stainless steel, so do not fret about bringing it right on in the salt water. This version of the Kershaw Sea Hunter has a square tip that is great for light prying jobs or chipping away at something. One side of the blade is plain edge while the other side of the blade is partially serrated for sawing your way through stuff. There is a notch on one side of the blade that can be used for ripping vinyl or other materials in a fast manner. 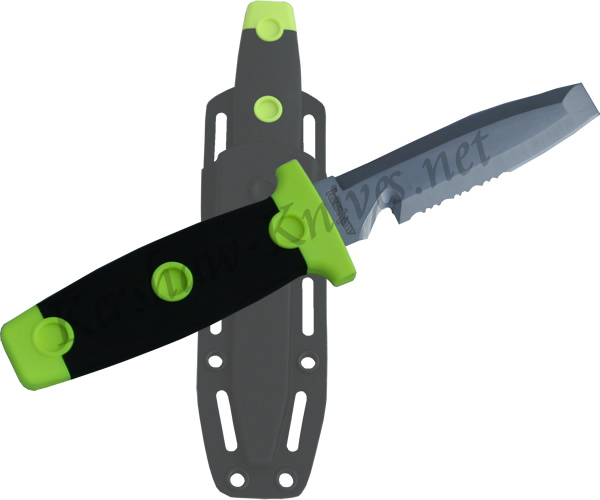 The handle is made of a soft neon copolymer that is perfect for wet conditions. The sheath is a divers sheath, and a couple of rubber straps come with the knife so that you can attach it to your vest, webbing, or whatever else.